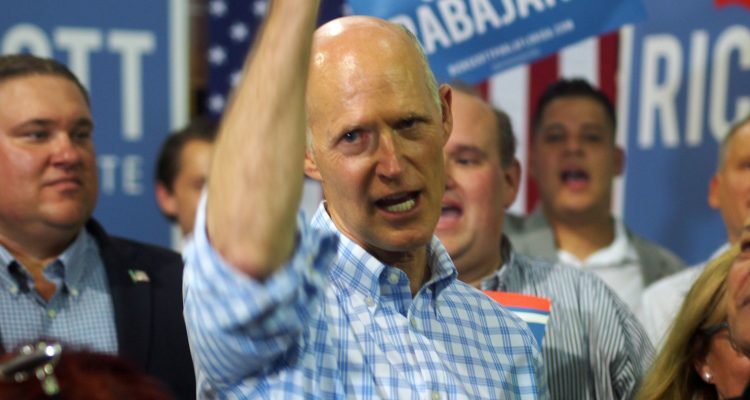 No one wins airtight, statewide elections quite like Rick Scott; now you can call him U.S. Senator. The former businessman who won election as governor by one percent, and then won re-election by one percent, knocked off Florida’s Democratic U.S. Sen. Bill Nelson by less than one percent Tuesday night in a contest that dragged way into the night while Democrats hoped and prayed in vain for a South Florida miracle. 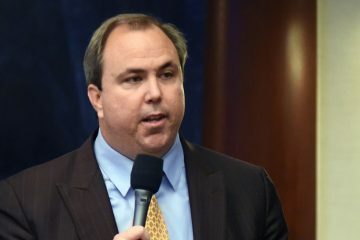 At 12:15 a.m., incumbent Senator Bill Nelson‘s longtime chief of staff, campaign manager and confidant Pete Mitchell addressed what was left of his campaign party, declaring the race had been called by multiple media outlets, that Scott had won, and that Nelson would be making a statement Wednesday. It was unclear if Mitchell was saying that Nelson also has called the race. An exhausted looking Mitchell merely entered the room, made the brief statement at the microphone, and left. Ultimately, Florida voters seemed to know and like Scott, for all his quirks and hard-line politics, more than Nelson for all his squishiness. Final score: Scott 50.21 percent; Nelson, 49.79 percent. 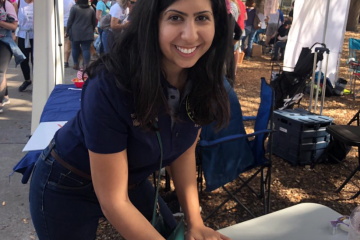 This election not only shattered Florida records for money spent on the campaigns — $177 million through last week, with bills still not posted — but also set new low-water marks for negative campaigning, as both candidates and their allies strove to define or redefine their opponents. For Scott, that meant Nelson and several Democratic committees combined to spend at least $80 million convincing voters that the governor cut education funding, stripped away environmental protections, oversaw Florida’s red tide disaster, waffled on health care pre-existing conditions coverage, refused to expand Medicaid in Florida, pushed through tax cuts that made rich people richer, and had a dodgy business career, highlighted by massive Medicare and Medicaid fraud by his company. Campaigns are “divisive” and “tough,” Scott said. While Scott’s campaign aggressively and sometimes angrily fought back against the charges leveled against him in the Democrats’ campaigns, Nelson mostly shrugged off Scott’s attacks. And in the end, voters figured they knew Scott; and, like his record or not, it won over the image of an empty suit. The governor vowed to bring to Washington the same business-like approach he used as an outsider when he assumed office eight years ago as governor. 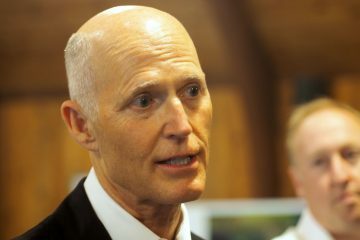 For all his public awkwardness that supporters say makes him look genuine and critics say makes him look creepy, Scott managed, especially in the closing weeks, to project a sincerity: someone who looked in command overseeing hurricane recovery, someone who looked comfortable playing with his grandchildren, someone who sounded true stating his positions. Also in play was Nelson’s card-carrying membership in the opposition to President Donald Trump, while Scott went from close friend and ally of Trump, to someone who hardly ever spoke the president’s name, to someone who joined the divisive party leader at a rally last week. 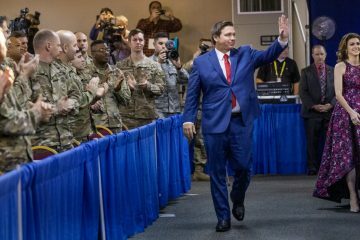 In huge swathes of Florida outside the urban cores, Trump’s support may remain unchanged, and party leaders like Volusia Chair Tony Ledbetter spoke of a Republican base that was angry, ready to vote. Many political observers postulated that Nelson had never previously been seriously challenged in his Senate campaigns, beating then-U. S. Rep. Bill McCullum in 2000; controversial Secretary of State Katherine Harris in 2006; and then U.S. Rep. Connie Mack IV in 2012, each by easy margins. Lucky some called him. Scott, meanwhile, was seen by many political observers as someone capable of overcoming negative campaigning against him to come out of nowhere to win, as he did in 2010, defeating Alex Sink 49-48; or with an underwater favorability rating, as he did in 2014, defeating ex-Gov. Charlie Crist, 48-47. His personal wealth certainly helped: he spent $73 million of his own money in 2010, and at least $51 million this time. In the end, Democrats were left with a now outgoing Senator who couldn’t convince voters he could fill his suit, and voters picked the politician they felt they knew better, despite Nelson’s 46 years in public service.